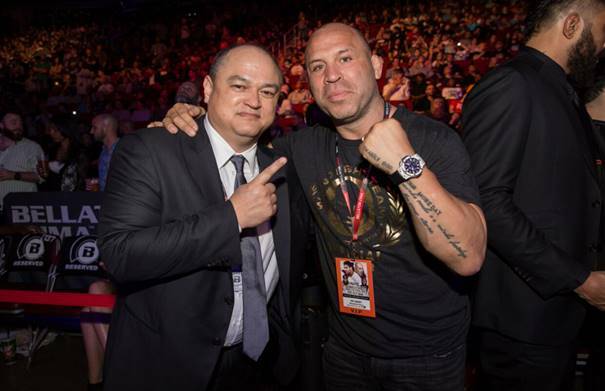 SANTA MONICA (March 2, 2016) –Bellator MMA is pleased to announce that one of the most popular, recognizable and beloved fighters in the sport of mixed martial arts, Wanderlei “The Axe Murderer” Silva (35-12-1), has signed an exclusive multi-year, multi-fight contract with the promotion. The 39-year-old publicly fielded offers from companies all around the world, but the former Pride FC Middleweight Champion made the decision to take his explosive style to Bellator MMA. “The Axe Murderer” has fought in some of the most memorable feuds and battles the sport has ever seen. His wars with Quinton “Rampage” Jackson, Tito Ortiz, Mirko Cro Cop, Vitor Belfort, Dan Henderson, Kazushi Sakuraba, Chuck Liddell, and Michael Bisping are the stuff of legend – but Silva is far from ready to close the book on his illustrious career. In addition to his Pride FC Middleweight World Championship, Silva’s packed trophy case of accolades includes awards for Fight of the Year (2003, 2004, 2007), KO of the Year (2008), and multiple Fight of the Night awards including one for each of his last three fights, just to name a few. He now looks to continue to provide his award-winning, entertaining fights inside the Bellator cage. Silva has several options for his first fight with Bellator. Although he has spent the majority of his career at 185-pounds, one of the things that his fans love most about him has been Wanderlei’s willingness to fight the best of the best – even if it was up two weight classes at heavyweight – as proven by his heavyweight wars against guys like Mark Hunt, Gilbert Yvel, Kazuyuki Fujita and Cro Cop; Or, his battles against light heavyweights like Ortiz, and his most recent opponent, Brian Stann, who he knocked out in the second frame. Silva is the latest in a long line of recent free agent signings made by Scott Coker and Bellator MMA. The former Chute Box competitor joins: Josh Thomson, Phil Davis, Benson Henderson, Sergei Kharitonov and Anastasia Yankova on a roster with champions the likes of: Marcos Galvao, Daniel Straus, Will Brooks, Andrey Koreshkov, Rafael Carvalho, Liam McGeary and Vitaly Minakov.